I took this photo on the 5th July 2011 at the Manari Road Blockade north of Broome, a day later named Black Tuesday (click here for more info: http://www.abc.net.au/local/stories/2011/07/05/3261383.htm). 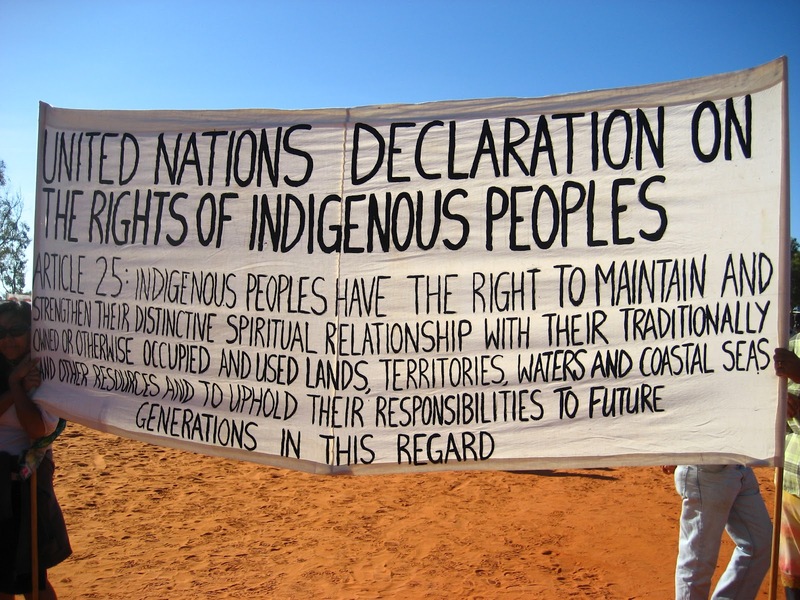 I had never read this article (from the UN Declaration on the Rights of Indigenous Peoples) before and during the day kept coming back to this banner, reading, re-reading and feeling so many things. I asked myself, is there any hope that such a declaration will genuinely be acknowledged by Australian governments and corporate interests, even the populous? On this day people from all cultural, political and economic backgrounds came together to stand up for country – more specifically, Walmadany (James Prices Point) and the west Kimberley. We were all saying by being there, that we love this country. The question I am still left with… how am I, a non-Indigenous woman, and my immaterial connections with country visible, legitimized?